On the newly redesigned venue pages (here’s TechCrunch, for example), there is now a big text input box for Tips. You type in what you want, and hit the share button and the tip immediately appears. This is much more seamless (and obvious) than the previous process. And tips are hugely important to Foursquare. They’re the things that pop up every time a contact checks-in to a place. You can also mark tips so you remember to do them later (and note what you have done). 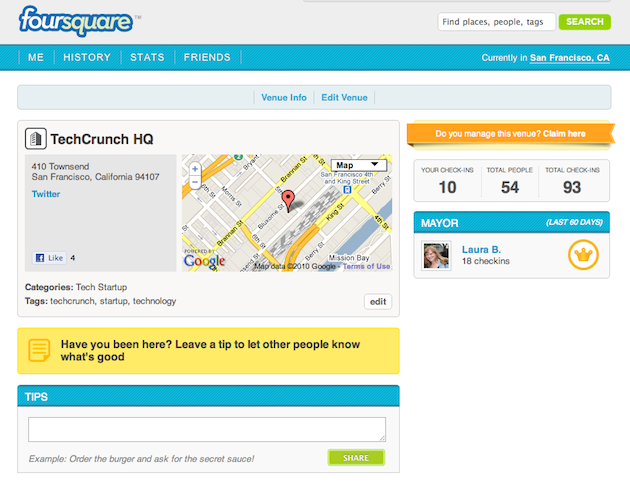 This is all about adding value on top of Foursquare’s fast growing social and place graph. These new pages also make it more obvious how the owner of a venue can claim the place as theirs (something Foursquare hinted was coming soon). And it more prominently shows “Total check-ins,” “Total people,” and “Your check-ins.” And, of course, the Mayor of the venue is displayed prominently. Foursquare, which is a mobile application, is in the process of gearing up for the launch of the 2.0 release of its service. You can bet that tips will be a big part of that as well.